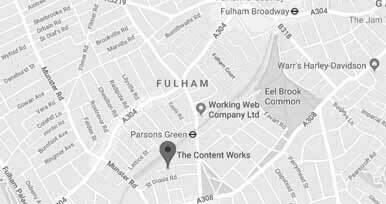 Welcome to The Content Works, a Google-certified London-based SEO consultancy, specialising in technical website audits. If you have a WordPress-based website – or any kind of website, for that matter – you’ve probably realised that even if you launch a website that looks great, it’s highly likely it’ll be far from well-optimised. If you want it to rank, follow these steps. 1 What is WordPress Optimisation? WordPress is a fantastically effective open source website creation tool, that really has revolutionised the way websites are designed and developed. But as with everything in life, it can sometimes need a bit of a helping hand to perform as well as it should do. Installing plug-ins, choosing less than perfect web hosting packages and over filling a site with content can make even a WordPress site run slowly. Optimising the site on a regular basis will help to maximise performance. All aspects of your website will offer a far superior user experience when they are performing properly. Decluttering content, optimising images and staying away from unofficial social media buttons or dodgy looking plug-ins, should help your WordPress website to load quickly, render well and increase conversions by offering an engaging and easy to use visitor experience. Which points should I look out for in particular? How do I go about optimising these weak points? In this article we’re going to go through and answer these questions step by step. By the end of it, you should be able to optimise your WordPress site’s foundation work in an hour – but we’ll also include a few extra tips to take your optimisation to the next level too. Two great tools to identify optimisation opportunities are Google Search Console and Screaming Frog. Let’s start by looking at Google Search Console. Google Search Console is a free tool provided by Google that helps you to understand the overall health of your website, and where its traffic is coming from. I will note that in order to gain useful data from their keyword insights, you need to set up Google Search Console around 2 weeks before reaping the results – but once the setup is complete, running it is pretty straightforward (and would fit within an hour!). To set up Google Search Console, you need to sign up with your email, then add the website you want to evaluate with the ‘add property’ button (where you also input your URL). You’ll then need to verify that this is your own website, which can either be done by downloading a HTML file from the console and adding it to your website root directory, or adding a HTML meta tag to your homepage in the head of the code (this is listed under the ‘alternate methods’ tab). Here we have shown the alternate method of verifying your account, but downloading a HTML file can be done using the ‘Recommended Method’ tab. When you have verified the account, you will then need to add your website’s Sitemap by inputting the Sitemap’s URL in the tab ‘Sitemap’ listed under ‘crawl’. 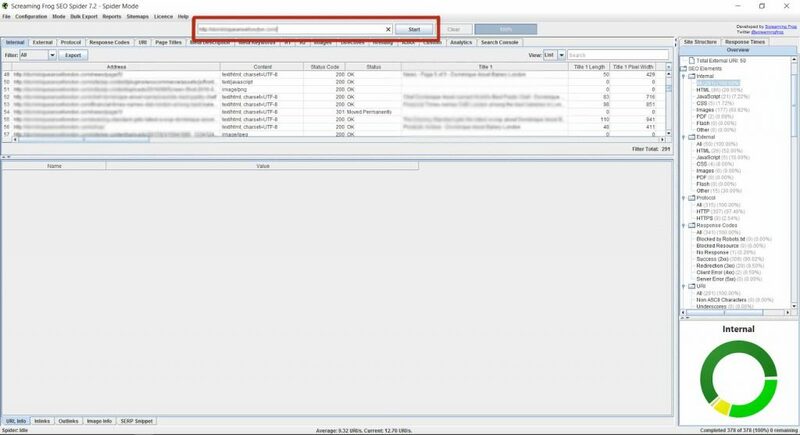 This will give the console a better idea of how all the pages on your website are organised, along with other information such as how often your site is updated. If there are any pages you don’t want to be crawled by search engines, then you would need to go and add robot.txt files – we won’t discuss the process here, but we have another detailed article on robot.txt files if you are interested to find out more. Finally, with everything set up, you can then go to the Search Appearance tab, find ‘HTML improvements’, and this will list things on your site that can be further optimised to make it run more smoothly for users and search engines. Now that the basics of Google Search Console are outlined, the other tool to consider is Screaming Frog. This is a paid service, but if you have a website with 500 or less pages to crawl it is free to use. This is even simpler to set up. Once you have downloaded the software, you simply open Screaming Frog, and put in the URL of the site you want to crawl at the top and hit ‘Start’. 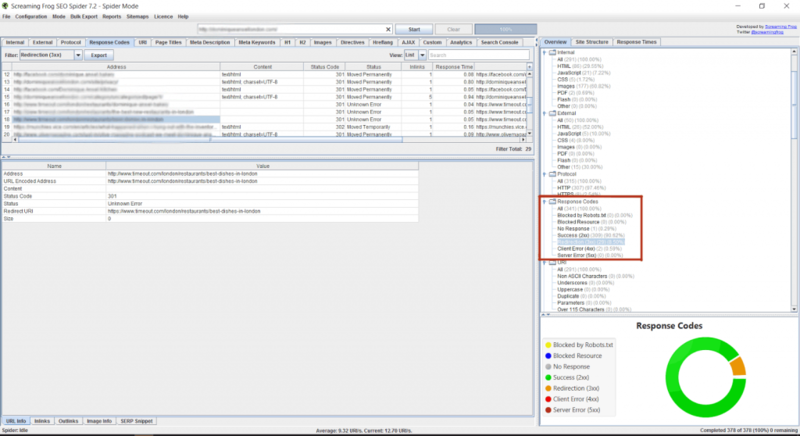 Screaming Frog will then work its way through all of your pages, and gather data on basic problems with your site. Add the URL of the website you want to crawl at the top, and it will collect data on each page that can be selected from the right-hand column. These codes (which are broken down further in our article on HTTP server response codes) will give you a quick idea of tell you whether your pages are loading correctly or not. Ideally, you want to be seeing the response code ‘200’ for your pages, as this indicates that the pages are loading successfully. There may also be a few ‘301s’, which indicate a permanent redirect – for example, if you changed the URL of one of your webpages, but somebody stumbles across the old one, they may be redirected to the new one, prompting a 301 server response code. This is not a bad thing; the main codes to be wary of are 400 or 500 codes – for example, the well known ‘404’, which indicates your web page can’t be found. If you come across any of these, then this is a good place to start fixing your website by trying to identify what is causing the response code, and fixing accordingly. Each page on a website – especially a blog-style website – should generally have a title, meta description (which is the snippet of text that appears under the link to your page in search results), H1s, and probably H2s. By including all of these, the search engine will have a better understanding of what your page is about. So if Screaming Frog or Google Search Console flags any of them up as missing, you should take the time to go and add them in. This is easy to do in WordPress; you simply need to go and find the page or post via the left-hand menu, select it for editing, and then alter as necessary (illustrated below). When you are adding them, make sure to include helpful keywords that you are hoping to rank for (we will cover this in more depth in the final section on Yoast plugins). Although having a title, description, or H1 is better than having none at all, it’s still important to make sure they’re not too long, otherwise they may get cut off in search result displays. If they’re flagged up as too many pixels or characters, you’d need to go into the editor in WordPress and shorten the title/meta description etc. – just make sure to try and leave in any keywords already in there, and make appropriate judgement calls. There’s no point shortening a title if it means that it loses its meaning and reads oddly! Note: just as titles that are too long can be a problem, titles (and meta descriptions and H1s) that are too short can also open an opportunity for more detail and description to be added, so that a better idea of your webpage’s topic can be given. If a keyword hasn’t already been added in there, this would be a good opportunity to try and introduce one. If you have more than one H1 to a page, this can dilute the overall importance of each H1, which means that Google will struggle to decide what to rank your page for, and overall harm your rankings. If your page has been flagged up to contain more than one H1, the easiest way to find it would be to visit the page itself, view the page source, and search for ‘<h1>’ in the code – this will show you where the H1s are on the page. From there you can decide which H1 you want to keep, and which to perhaps change. Larger images take longer to load, which in turn cause page speed to be slower. It’s thus best that images are kept below 100kb whenever possible. To do this, it’s best to follow our guide on how to optimise images, and then add the re-optimised image to WordPress afterwards. Whilst the optimisation tips above will give you a sturdy foundation, if you want to go the extra step a great thing to do is get the Yoast plugin for your WordPress website. Yoast is a great tool for helping you refine your webpages so that they are fine-tuned to target your chosen keywords, giving you a checklist with everything from keyword density to whether your keyword appears in your headings. The best way to use it is in partnership with Google Search Console. First, use Google Search Console to identify the keywords people are searching for in order to get to your website. Once you have identified some which seem promising, it would be good to use them as focus keywords for different pages on your website. See which pages these focus keywords would be relevant on, or perhaps consider creating content around those keywords if there isn’t anything. Then, once the page has been identified (or created), you can put that focus keyword into the Yoast plugin, and go through the checklist of items to make sure the page truly targets that keyword. Can You Guarantee Page One Google Rankings? NOT SURE OF THE SERVICE YOU REQUIRE?